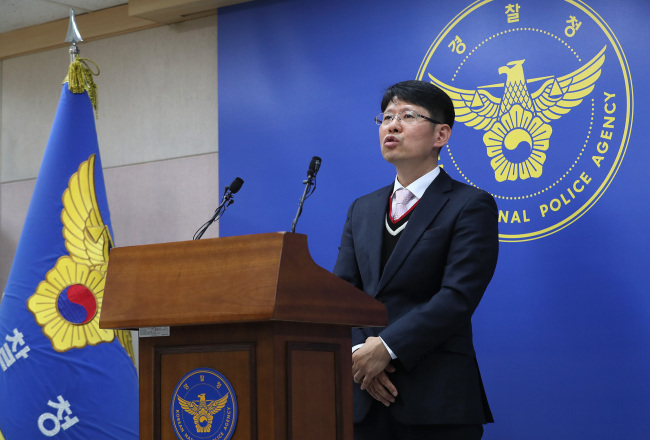 Woo Byung-woo, an imprisoned former aide to ousted President Park Geun-hye, faces a new prosecution probe, this time concerning alleged violations of laws regulating attorneys. Police wrapped up their inquiry Wednesday into allegations that while practicing law, Woo accepted money from three corporate clients between 2013 and 2014 in return for lobbying the prosecution. Police booked Woo and referred him to the prosecution, recommending indictment. Woo served as presidential secretary for civil affairs from 2015-2016. He is currently serving a 2 1/2 year sentence for his involvement in the massive influence-peddling and corruption case that led to Park’s removal from office last year. Woo, a former public prosecutor, is accused of accepting a total of 1.05 billion won ($931,000) from Hyundai Group, a university hospital and a construction company in return for influencing prosecutors to stop criminal investigations targeting them. He did not carry out the legal procedures necessary to take on the cases, according to the police. His clients testified that they hoped Woo would pull strings to sway the outcome in their favor. Woo told police that he does not remember the cases and insisted he signed proper contracts with the firms as a legal adviser and attended the legal counsel meetings.